Thanks for taking the time to chat with us!! In a couple of sentences, can you describe your current role? I am responsible for the day-to-day operations of the Showplace Theatre. I work closely with several departments to ensure each event is a success. Walk us through a show day for you. A “show day” begins by arriving to work just before the entertainers arrive. I start off by greeting the group. Next, I begin showing them the dressing rooms, the green room, the hotel and I provide them with their meal vouchers. Once they start loading in their sound equipment, I head to my office and get to work. Throughout the day, I am available to assist the tour manager with any hospitality needs. I work with my team to make sure the theatre is set up for the concert, stanchions are set up for will call and the merchandise tables are ready to go. About 15 minutes before opening the doors, my team and I have a meeting to discuss the details of the night. After that, I assist with the meet and greet. Once the show starts, I handle any customer complaints and if I am lucky, I get to enjoy part of the show! When the show is over, I head backstage to deal with any last-minute needs of the group. Once they leave, I clean up the green room and head home. Wow, it sounds like you stay busy! How does your day look when there’s not an event in the Showplace Theatre? A typical “non-show day” consists of preparing for the sale of new shows, coordinating with event planners, overseeing setups, scheduling events staff, processing ticket requests, attending meetings, handling customer service issues and a lot of email correspondence. I work with tour managers to advance each concert. This includes setting up transportation needs, booking hotel rooms, ordering caterings, setting up meet and greets, obtaining times for arrival, load in, sound check and taking care of any other hospitality needs for the artists. Have you had any odd or interesting requests from entertainers? Oh yes, I’ve had entertainers ask for anything from dog beds and puppy pads to hiding a single red gummy bear inside a bowl full of Swedish fish. I’ve also had entertainers ask for “a smile to break up the monotony” or a dozen red roses to shred on a guitar! It sounds like there’s never a dull day around the Showplace Theatre! What’s your best memory from working a concert? My favorite memory is when Kane Brown came off the stage and said, “Dondi, I’m about to go win all of your casino’s money,” and started laughing. Of course, I am a HUGE Kane Brown fan, so it was pretty cool to hear him say my name! That’s so neat! Are there any shows you’re looking forward to? I can’t wait to see Wynonna & The Big Noise in July. As a child, I always loved listening to The Judds with my mom. We can’t wait to see Wynonna either! Before we let you get back to your busy schedule, can you tell us what makes entertainment at the Showplace Theatre so special? In my opinion, teamwork plays the biggest role in making Riverwind concerts a great experience. 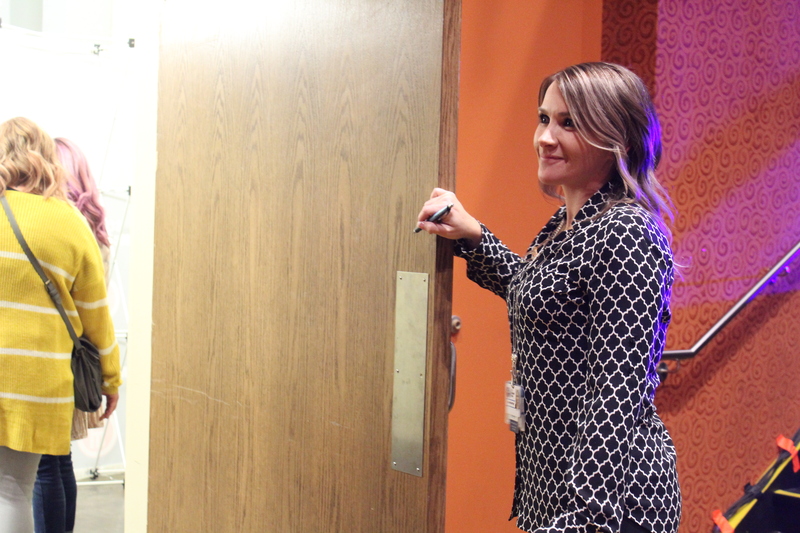 The entire staff here is amazing and that is truly what makes Riverwind Casino such a special place! We would like to thank Dondi for taking a few minutes to sit down with us and talk about all the amazing things happening at the Showplace Theatre! With concert dates all month long, you’ll surely find a show you won’t want to miss. Take a look at our entire entertainment lineup and we hope to see you inside the Showplace Theatre soon!